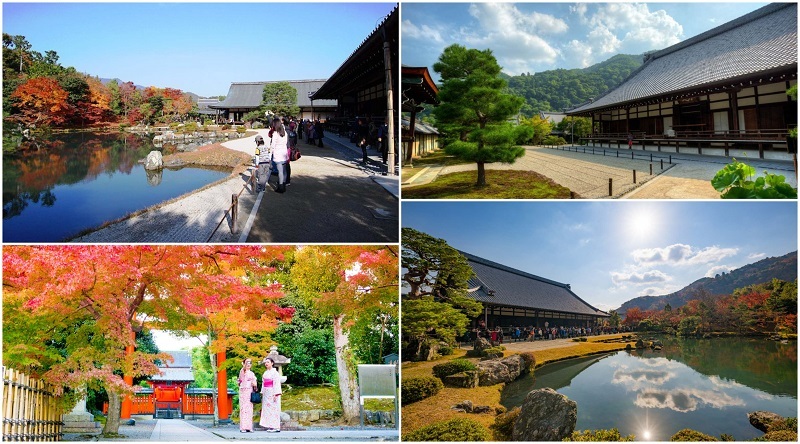 Are you thinking about going to Kyoto for a holiday? 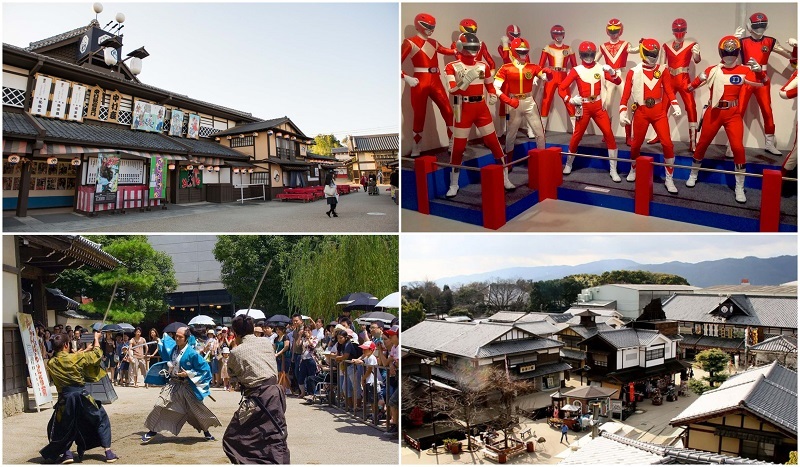 Or are you planning on making this city part of your 2 week Japan itinerary? 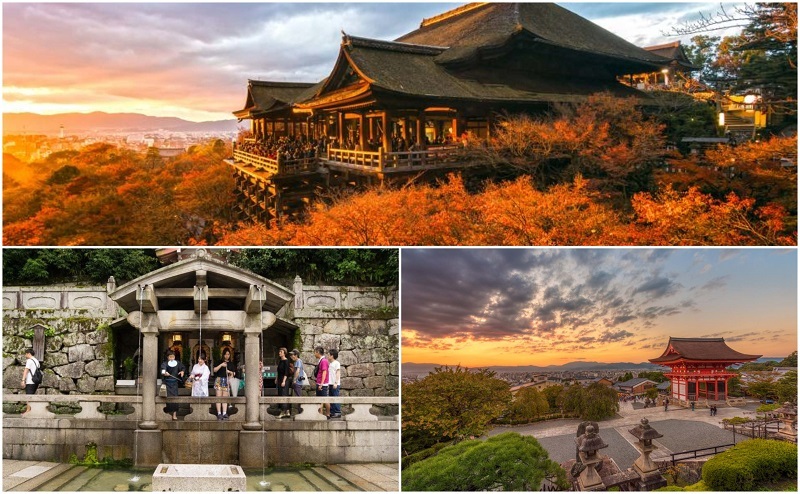 Either way, we’ll show you the best things to do and see in Kyoto. Kyoto is a city of history and culture, of contemplation and reflection. 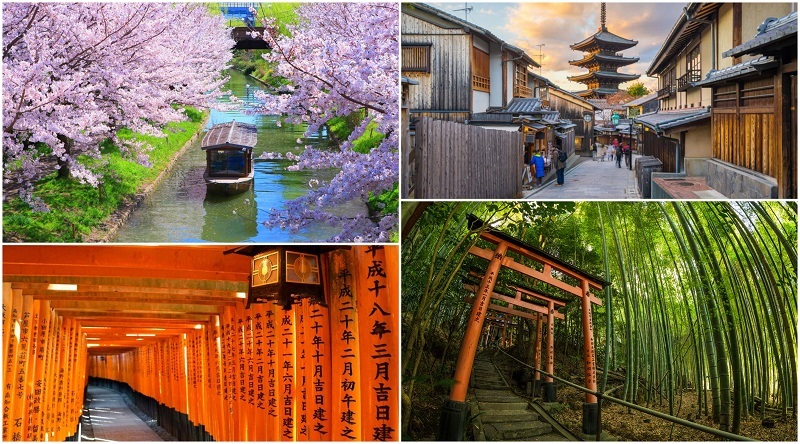 It’s home to some of the most incredible sights in Japan, so get your joggers ready as we share the best things to do and most popular Kyoto attractions! Kinkaku-ji or the Golden Pavilion is one of the top sights to see in Kyoto thanks to it being one of the most lavishly decorated and artistically diverse temples there. It is covered in a thin veneer of gold leaf and each floor is designed to invoke a different style of Japanese architecture. 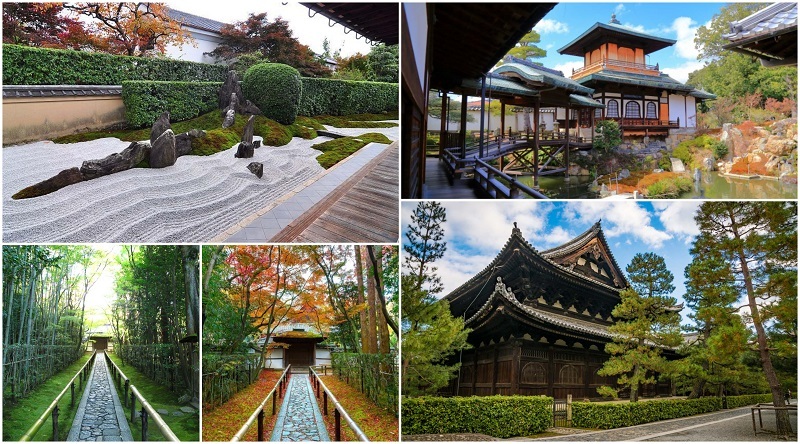 It was originally built around 600 years ago and the entire temple grounds with its teahouses and gardens are designed to create a sense of calm contemplation. If you want a picture perfect shot, be patient as there will be many other visitors trying to get a photo near the entrance where there is a standing platform. 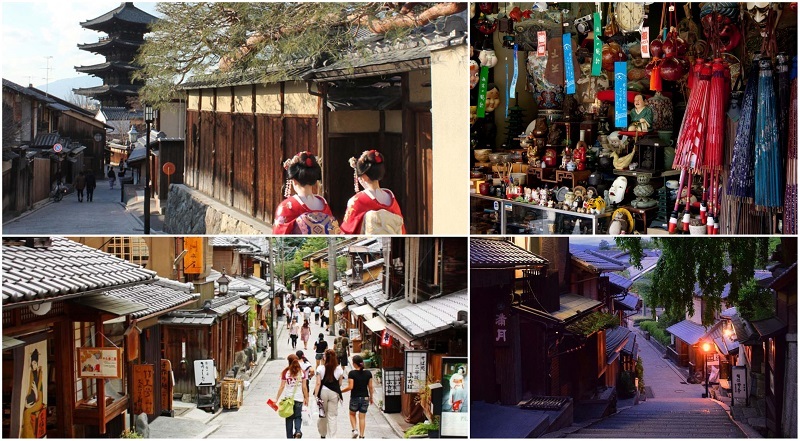 The walk up to Kiyomizu-dera is filled with snacks, local souvenirs and happy families passing by. The Buddhist temple itself was renovated recently and strikes a beautiful orange hue in the sunset from which you can see a wonderful view of Kyoto. It’s named after a waterfall running within the complex. Visitors can drink the water and it’s believed to have wishful powers. Kiyomizu Temple is a popular gathering especially during festivals. This place used to be the official Imperial Palace of Japan until 1868 when the imperial family moved to Tokyo. Thankfully, you don’t need to book in advance and can casually stroll in during its opening hours. While it’s not allowed to enter any of the buildings here due to its sanctity, you can walk the same grounds where a thousand years of Japanese imperial court life happened. Nijo Castle was built by Tokugawa Ieyasu, the great unifier of Japan, and served as the location of its de facto government for over 200 years. 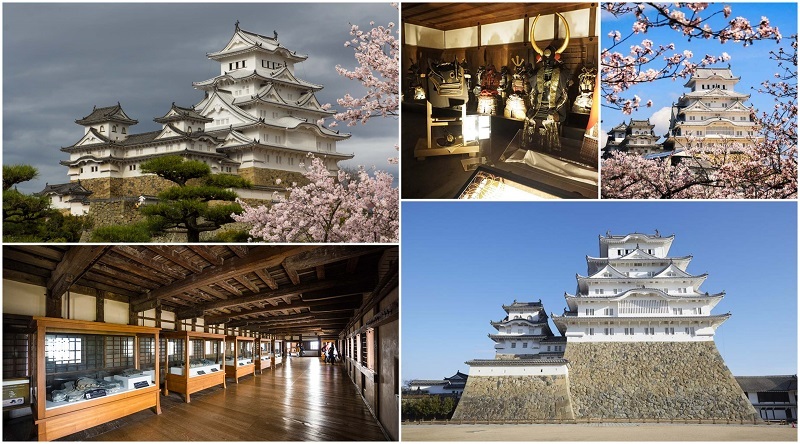 Today, you can view the battlements that surround the castle, walk through its cherry blossom gardens and even enter the room where the most powerful man in Japan, the Shogun, would meet dignitaries. 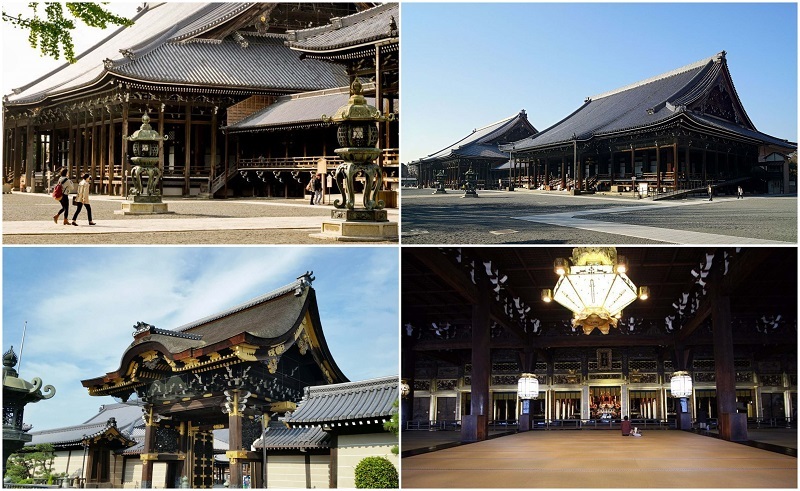 Classified as a National Treasure of Japan, Sanjusangendo Hall is part of the Buddhist temple Sanjusangendo and is the country’s longest wooden structure at 120 meters. This massive hall dates back to 1266 during the Kamakura period. The temple is also widely known for housing the gigantic 1000-armed Kannon (the goddess of mercy), 100 thousand-armed Kannon (this time, standing – 500 each on both sides of the seated Kannon), 28 standing attendants, and statues of Raijin (god of thunder, lightning, and storms), and Fujin (god of the wind). Get ready for a culinary adventure when you visit the Nishiki Food Market, with more than 100 restaurants and shops spread over five blocks to explore. This is where you will find Kyoto food wonders such as sushi, sweets, dried seafood, and pickles, alongside fresh produce, cookware, and fresh seafood. Check out the food establishments that range from tiny stalls where you can buy food and eat them while walking, to larger restaurants where you can sit and enjoy a relaxing meal. Discover why this bustling retail market is called “Kyoto’s Kitchen”! Fushimi-inari Shrine is a temple that spans an entire mountain and is filled with thousands of torii gates. As it is a Shinto shrine (Japan’s old religion), you’ll see statues of foxes and small shrines for spirits everywhere. The walk up to the top can take up to 2- 3 hours and will offer the best view of Kyoto by far. Fushimi-inari can truly boast an otherworldly feel to it especially at night. As the temple is open 24/7, you can come after dark and walk through the almost ghostly paths surrounded by gates and shining with the warm orange light of hoisted lanterns. 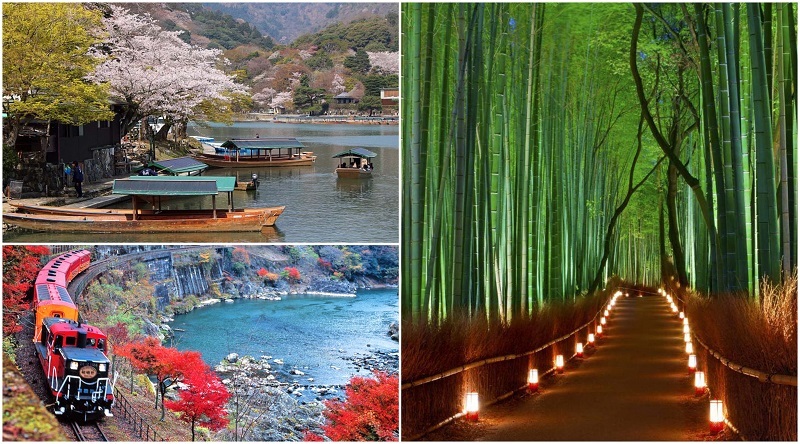 Arashiyama is probably the farthest sight you’ll visit from central Kyoto but it’s absolutely worth it thanks to the quaint, old restaurants and the absolutely gorgeous bamboo forest. The trees here are verdant green and have grown to such a height that it can make the walking paths dark even at noon. Make sure to get some matcha ice creams and stroll through this wonderful forest! Learn everything there is to know about sake (Japanese rice wine) in the Gekkeikan Okura Sake Museum, which is run by one of the most prominent sake companies in Japan, Gekkeikan Sake Company, Ltd. Explore the history of sake and its production in an old sake brewery dating back to 1909, where exhibits include over 400 items used for sake production. Feel the history of the place and be transported to an old Japanese brewery as chants used by traditional sake makers play throughout the museum. Your visit will conclude with sake and Ginjoshu tasting in the museum lobby. The Kinshi Masamune Horino Memorial Museum is situated in the original site of a brewery in Sakaimachi Nijo, which was built in 1781. You will get to see the tools used in traditional sake production in this museum in central Kyoto, which was opened to pass down the sake culture and help keep it alive. The Kinshi Masamune brand of sake is one of the most famous in Kyoto; you will learn about their history through exhibits and photos of the equipment they use for brewing, in a traditional Japanese house (“Machiya”) setting. Take a tour in and around Yasaka Shrine, a well-known shrine and tourist attraction in Kyoto. This shrine is also the location of what may be Japan’s most popular festival, the Gion Matsuri which is commemorated every July. Hundreds of participants gather with gigantic floats during this summer festival, which has been celebrated for more than a thousand years. Visitors flock to the shrine in and around early April every year, as it is adjacent to a famous spot to go to during the cherry blossom season – Murayama Park. Spend hours exploring the walled temple complex of Daitoku-ji and be amazed at the stunning architecture and pockets of picturesque Zen gardens. 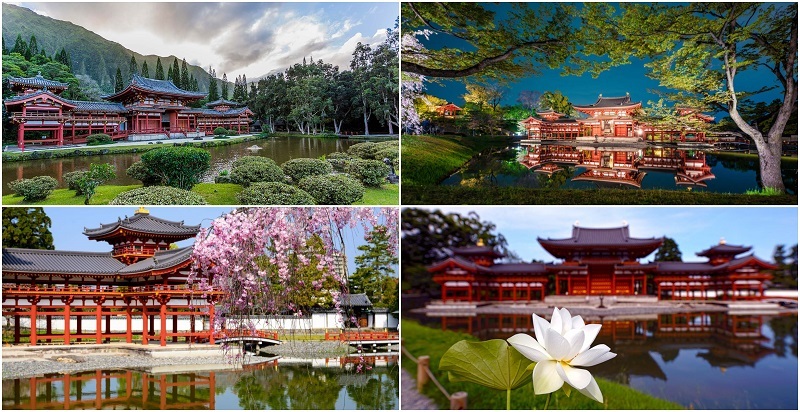 The complex is actually made of 24 smaller temples (with only four of them regularly open to the public) where you can experience fascinating peeks into the Japanese aesthetic, through calligraphy, painting, architecture, the Zen gardens, and tea ceremonies. Daitoku-ji Temple was closely associated with tea master Sen no Rikyu and has since been developed into a tea ceremony center. Gion is a geisha (or “maiko” in Japanese) district where you can still see geishas wearing kimonos strolling around the city. 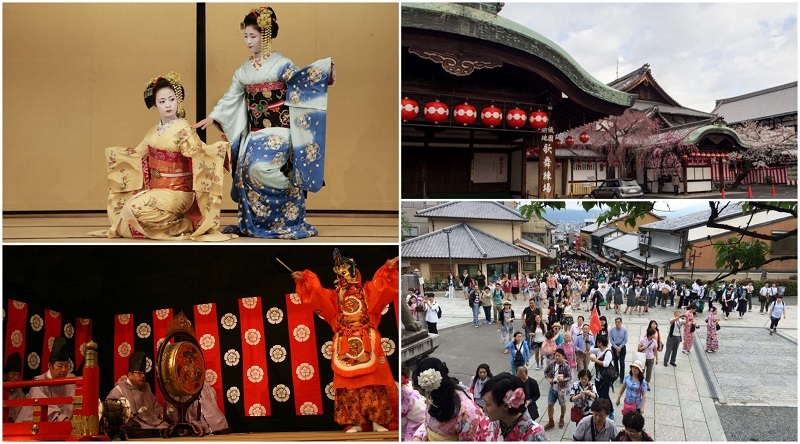 In Gion Corner, you can have a wonderful cultural experience with the geishas performing dances, enacting a tea ceremony, playing music and much more. The show happens twice every day at 6 and 7 pm so make sure to be on time. 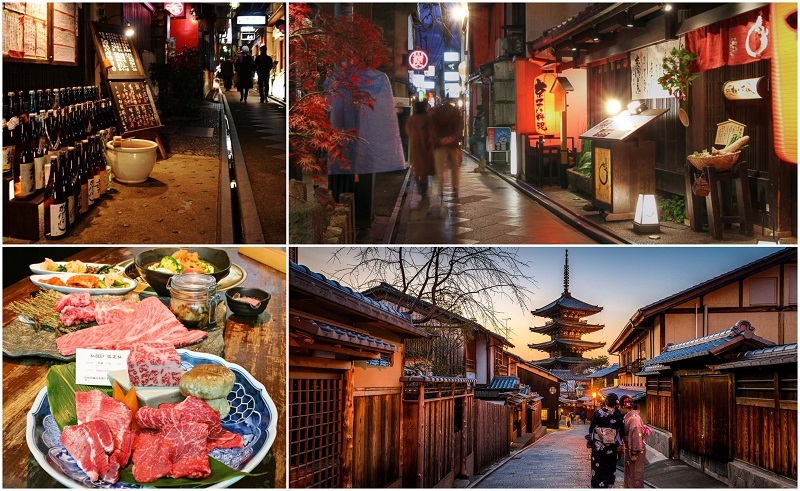 Gion is also a fantastic area for enjoying good food. Registered as a UNESCO World Heritage Site, the Tenryu-ji Temple is Arashiyama district’s most important temple. 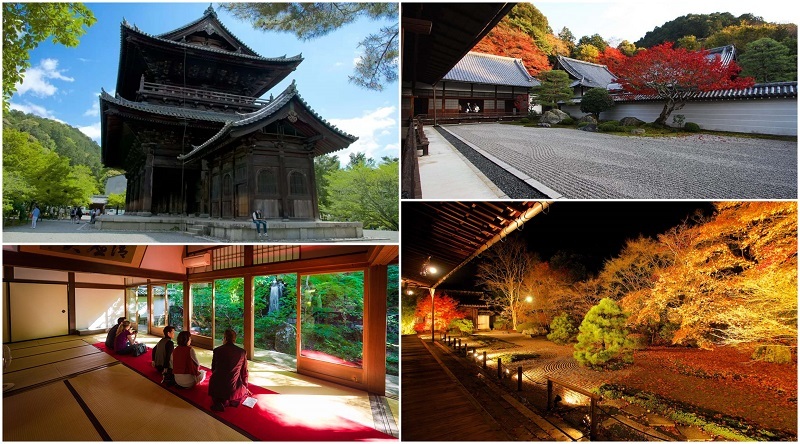 Built in 1339, it has the highest ranking among Kyoto’s five great Zen temples. Enjoy a leisurely walk around while surrounded by one of the most beautiful gardens in Kyoto, and gaze at the tranquil pond for a few moments of contemplation. Making the scenery more breathtaking are the majestic mountains of Arashiyama in the background, perfectly incorporated into the stunning views in and around the temple. Half an hour away from the vibrant Kyoto city center lies the neighborhood of Sagano, which is adjacent to Arashiyama at the base of the city’s western mountains. 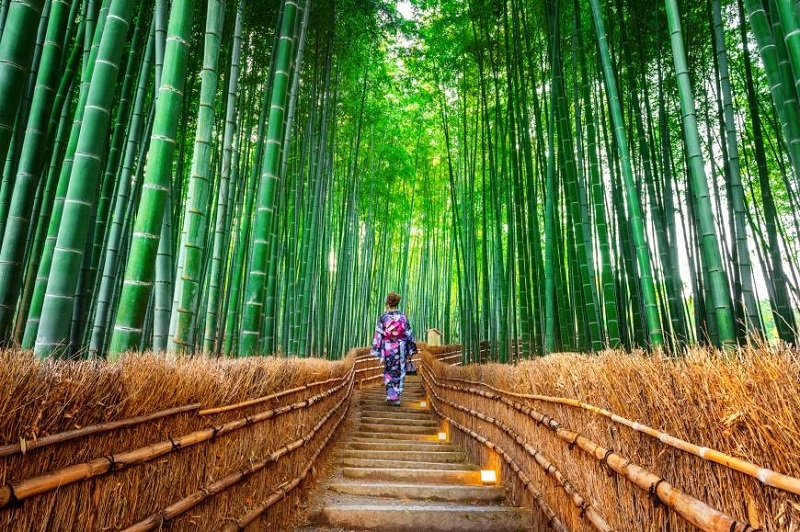 Don’t miss the chance to visit the enchanting bamboo forest, where the grove’s swaying bamboo stalks sound has been designated to be a governmentally-recognized sound. Get away from the hustle & bustle of city life in this pocket of natural wonder, where you will be surrounded by gently-swaying bamboo trees that reach into the sky. 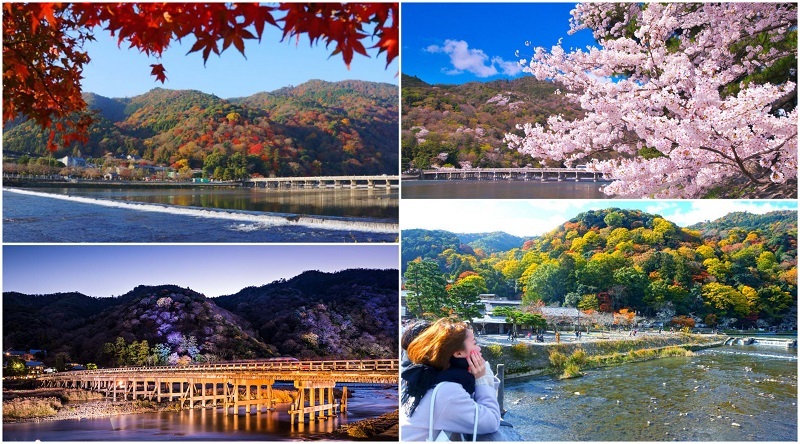 Ride on an old-fashioned train on the Sagano Scenic Railway, which leisurely passes through the mountains so you can bask in scenic views of the Hozu River, a tree-lined ravine, and on to the basin of Kameoka. 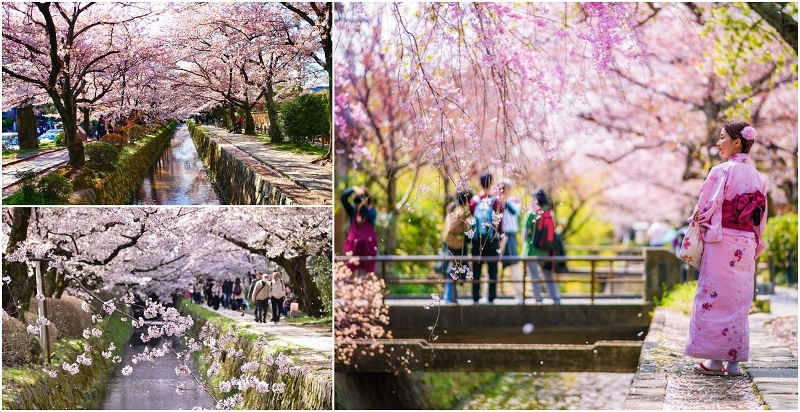 The Philosopher’s Path is a 2-kilometer pedestrian path following the route of a canal, which is made more picturesque with hundreds of cherry trees. The path was named so because the 20th-century philosopher Nishida Kitaro used to frequent the area for his daily meditation. Walking through the tranquil path will give you a glimpse of shrines and temples such as the Honen-on that boasts of an imposing entrance gate. The path is also lined with several boutiques, cafes, and restaurants for your pleasure after the calming stroll. Its Sanmon gate is Japan’s oldest Zen main gate and a National Treasure. The temple is renowned for its architecture and beautiful gardens. In autumn, the place is filled with people who can enjoy the spectacular view of a valley filled with the fiery leaves of maple trees. Head to the 100-meter long Tsutenkyo Bridge – a covered walkway where you can have the best views of the maple trees’ awe-inspiring autumn colors. This shrine was built as a dedication to the spirits of first and last emperors who had their reign from the city – Emperor Kammu, and Emperor Komei. 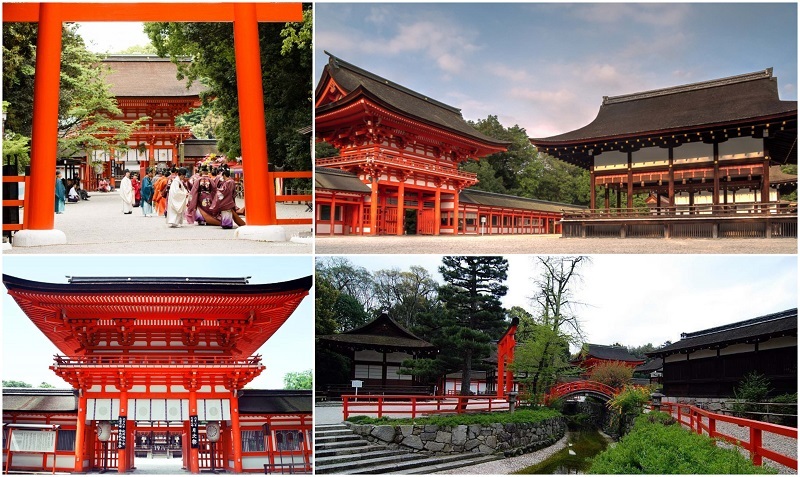 Heian Shrine is one of the most important Shinto shrines in Kyoto, where you will be welcomed by an imposing vermillion shrine gate (“torii”) that stands almost 25 meters high. Inside the shrine grounds, you will see a smaller version of the original Imperial Palace dating back to the Heian period. Check out the lovely garden with its multitude of cherry trees that bloom later compared to other trees, making this a popular cherry blossom spot in Kyoto. Listed as a UNESCO World Heritage Site, the Ninna-ji Temple is one of Kyoto’s great temples. 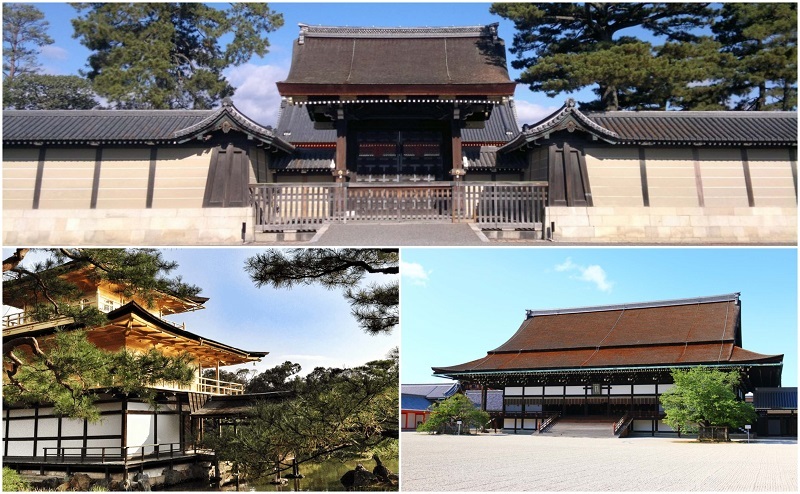 The original buildings built in 888 were damaged by fires and wars, and now the oldest buildings – such as the Kannon Hall, the main hall (“Kondo”), the front gate, and the five-story pagoda – date back from the early part of the 1600s. 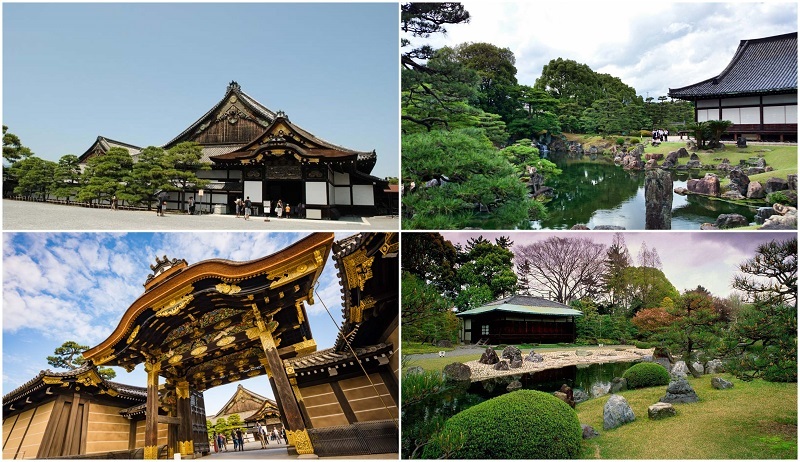 Check out the Goten, designed to resemble an imperial palace connected by covered corridors and flanked outside by lovely pond and rock gardens. The complex is also home to Umuro Cherrie which bloom later than other cherry trees, making this an ideal spot to visit towards the end of the cherry blossom season in Kyoto. The magnificent white exterior of the Himeji Castle beckons from a hilltop, and it’s not surprising that this is one of the most visited castles in the country. A UNESCO World Heritage Site, it earned its nickname, the “White Heron” because of its appearance, which is said to resemble a bird about to take flight. The maze-like design of the complex is due to its original purpose as a fort, with more than 80 buildings connected by winding walkways and a series of gates. The Sannomaru bailey features a lawn lined with cherry trees – an ideal spot to enjoy during the cherry blossom season. This sprawling Zen complex is home to one of the most important Zen temples in Japan. Welcoming you is the imposing Sanmon gate, which is one of Japan’s biggest temple gates. Take a look at the Hojo, the priest’s chambers built out of the old Imperial Palace and which are now a national treasure. A dry landscape garden gives off a tranquil vibe that will energize your spirit. The Choshoin subtemple is dedicated to the preservation of a vegetarian cuisine style that focuses on simplicity without sacrificing a delectable result. Here is where you can feast on a Japanese lunch, traditionally made for the past three centuries. The 155-meter Togetsukyo Bridge follows the Saga Arashiyama, and is the area’s main landmark. The architectural aesthetic of the bridge has popularly been featured in several period films. During summer, you can feed koi fish or watch cormorant fishing from the bridge. In springtime, you will be surrounded by stunning cherry blossom trees that make for the perfect background for unforgettable photos. A stroll across the bridge will take you to a small pier where rental boats await you for a magical cruise down the river. Veer away from the main tourist path by visiting the quaint Jojakko-ji Temple, situated on Kokura-san Mountain that is renowned for the autumn leaves & for being home to royalty, poets, and nobility. Do a little quiet contemplation in the 12-meter tall pagoda surrounded by tranquil greenery, while you gaze at the amazing views of the Arashiyama area from the mountain slope. With more than 200 maple trees, the temple offers breathtaking views of the fiery leaves during the spring and summer time. This temple was originally built as a powerful politician’s countryside villa, featuring Jodo (Buddhist Pure Land) architecture. The temple’s most notable feature is the Phoenix Hall, named as such because of its shape and the two phoenix statues on the roof. This Hall is one of the few wooden structures from the Heian period that are still standing. Situated underground is the treasure house that securely houses the temple’s most prized artifacts, including national treasures and vital cultural valuables. Learn more about Byodo-in’s history through multi-lingual exhibits and displays shown in the treasure house. The Chion-in Temple is one of the most popular temples in Kyoto. You will be welcome by the temple’s massive Sanmon gate, the country’s largest wooden gate measuring 50 meters wide and 24 meters tall. The steep staircase towards the main compound was notably used as part of the Tom Cruise film, The Last Samurai. Climb another set of steep steps to get up close and personal with the largest temple bell in Japan, weighing in at 74 tons. Visit the mausoleum containing Honen’s ashes, or take relaxing strolls on the gardens while surrounded by lush greenery. 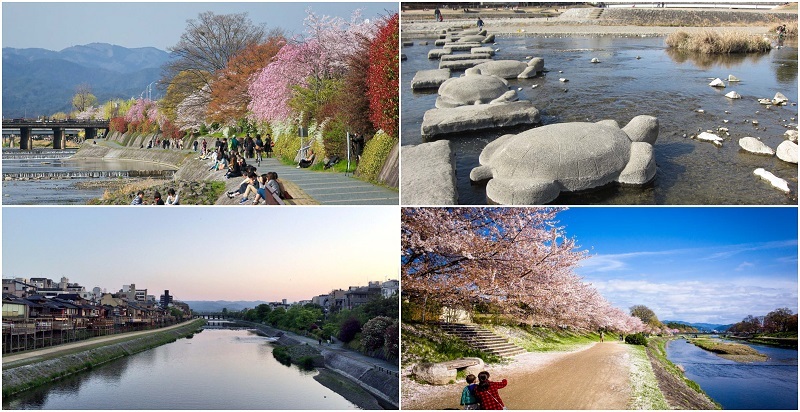 Don’t miss a chance to experience Kyoto’s most popular river – Kamogawa River. Walk along the river banks to breathe in the fresh air and enjoy the time away from the busy streets of the city center. You can even ride a bike on the sides of the river or cross the river itself using the strategically-placed stepping stones. During the summer months, restaurants open their balconies so their customers can feel the cool breeze coming from the river as they enjoy their sumptuous meals. The river bank becomes enchantingly illuminated at night, making it ideal for a romantic evening stroll. Located in Kyoto’s notable geisha district, the Kennin-Ji Temple is one of the city’s five great Zen temples (ranked third). Built in 1202, it is also Kyoto’s oldest Zen temple. Moss and gravel gardens surround the main buildings, which are accessible after paying an entrance fee (other areas are free to the public). The interiors of the main buildings feature sliding doors with depictions of dragons. Check out Dharma Hall where the ceiling is painted with a stunning image of twin dragons, commissioned to commemorate the 800th anniversary of the temple in 2002. The clear waters of the Kiyotaki River are home to the largest amphibian in the world – the giant Japanese salamander, which can grow so as long as 1.5 meters. While it is not guaranteed that you will see this living fossil, it is still best to watch where you step while in and around the river. The river winds through the forest and the mountainous area of Takao, which is where avid hikers head off to for its wooded trails. The area is surrounded by a dense forest, which is ideal for “shinrinyoku” or the practice of soaking up nature by walking amongst the trees. 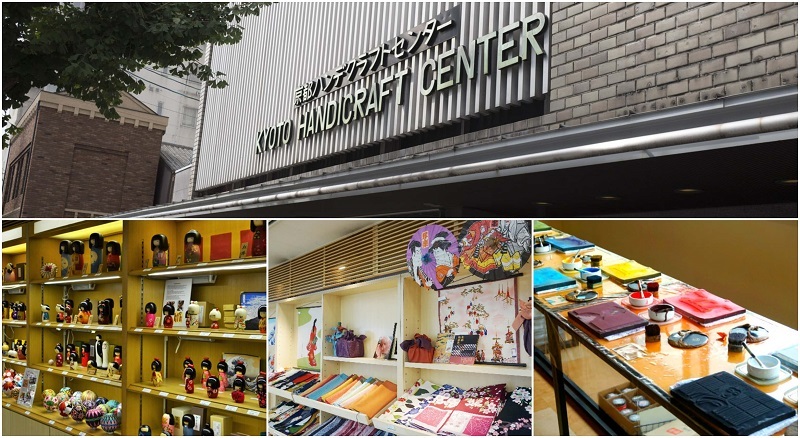 The Kyoto Handicraft Center showcases the best of traditional Kyoto crafts, as well as souvenirs of the highest quality. This is where you can buy the most beautiful items to give out as gifts back home, or as keepsakes, such as origami, calligraphy, woodblock prints, Japanese candles, and a host of other arts & crafts. Check out the pottery and jewelry selection for items that you can bring home, maybe to start your own collection? Best of all, you can purchase these amazing items at the Kyoto Handicraft Center using other currencies, and duty-free! This main transportation hub & railway station features a cutting-edge design which provides an admirable contrast to the Kyoto that tourists usually consider as the capital of traditional Japan. The spacious main hall is equipped with a roof of exposed steel beams called the Matrix, which depicts the grid-like Kyoto city layout and the station’s futuristic architecture. The station is divided into 2 sides: Karasuma which faces downtown, housing several shops, hotels, the Kyoto Tower, and the main bus terminal; and Hachijo which has highway bus stops, the Toji Temple, and a few hotels. The station’s building is also home to an art museum, a wide array of dining and shopping establishments, a theater, and the Granvia Hotel. Located on the northwest side of the Kyoto Station lies the Nishi Hongan-ji Temple, where you can experience modern Japanese Buddhism through its architecture and historical significance. It is part of a compound housing two Honganji temples, the Nishi (western) temple and the Higashi (eastern) temple, with the entire complex registered as a UNESCO World Heritage Site. 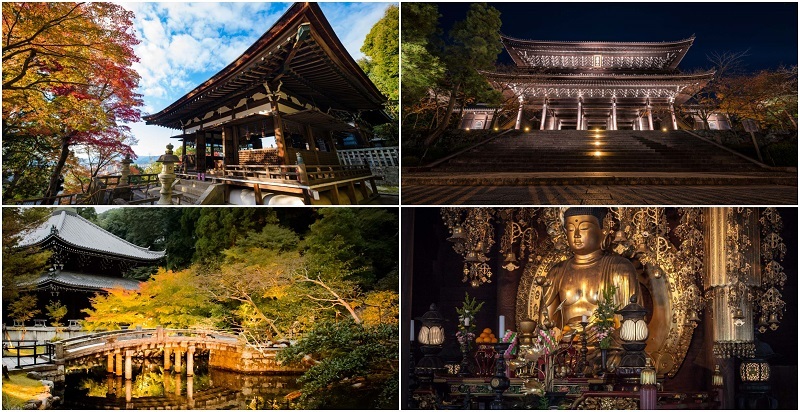 Visit the Amida-do, the main worship hall that houses an image of Amida Buddha on the central altar. Other notable structures include the Gingko Tree, Bell Tower, Scripture Repository, Karamon Gate, and the Drum Tower. The complex also has a café, souvenir shop, and bookshop. Pontocho is a geisha district in Tokyo which is renowned for preserving the traditional forms of entertainment and architecture. This area is home to many geiko (or geisha) and maiko (apprentice geisha) houses, as well as traditional tea houses. At night, the area is lit up with traditional lanterns that will take you back to the way the Japanese lived centuries ago. The cobblestoned alley is lined not only with tea houses, geisha houses, and brothels but also with high-end restaurants with riverside dining outdoors, serving a mix of cuisines for the discerning palate. Ryoan-ji is probably the most philosophical of the zen temples thanks to its simplicity. 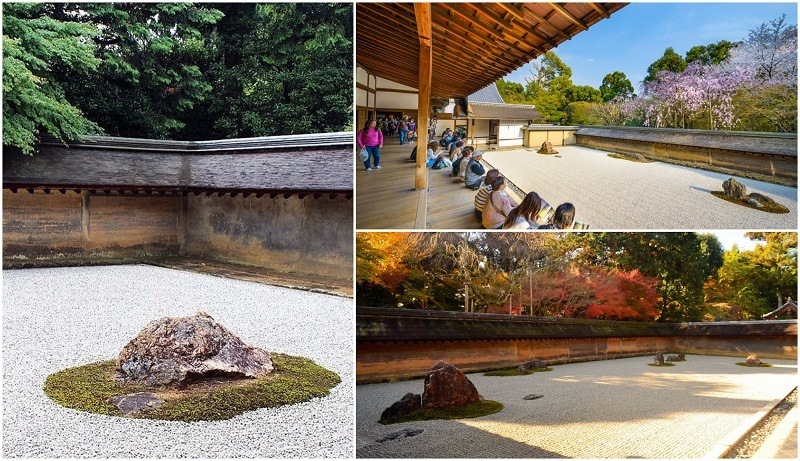 Once you enter the temple grounds, you will be greeted with rock formations in a garden that can only be viewed from a single viewpoint due to the location of the terrace. The garden itself encourages you to contemplate the immutability of nature and how only changes in your own perspective can create a change in what you view. You’ll be asked to take your shoes off on entry. Take your time to walk around the rest of the area to get a feel of Japanese culture. The sloping streets of Sannenzaka and Ninenzaka may be the most picturesque ones you will ever encounter in Japan – and elsewhere. Both of these streets are open only for pedestrians, so you can leisurely and safely stroll around without worrying about vehicles around. These streets are free from unsightly overhead power lines and lined with lovingly-restored shophouses, transporting you to Kyoto historic time, untouched by the modern world. Quaint tea houses and restaurants abound in this area, including the wistful Japanese café, Kasagiya. Along with Kamigamo Shrine, the stunning Shimogamo Shrine is a UNESCO World Heritage Site and one of Kyoto’s oldest & most important shrines. The buildings the shrine grounds are brightly-colored and provide a striking background to the loveliest photographs to remember your Kyoto adventure by. This shrine is surrounded by the beautifully-preserved forest of Tadasu no Mori, which has remained untouched by modernization; it is home to trees that may be as old as 600 years old. Each year on May 15, the shrine hosts the Aoi Matsuri Festival – one of Kyoto’s main festivals. The historic Teramachi Street is home to one of the city’s main shopping districts. 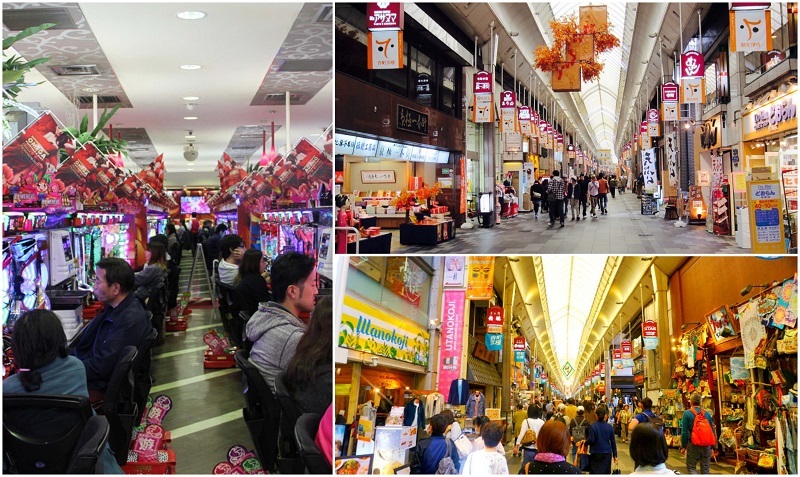 This covered shopping arcade is the place to go to for your dose of retail therapy in a more refined ambience (compared to the noisier Shinkyogoku area). Check out clothing shops offering the latest in fashion, and also those with a more traditional style outlook. The street is also home to bookshops, art galleries, pachinko parlors, souvenir shops, stores selling religious goods (such as prayers beads, Buddha images), and other retail establishments. Here you can have a taste of what new Kyoto has to offer with its vast array of modern artists. The museum itself hosts exhibitions with diverse themes that not only include paintings but also textiles, pottery and jewellery. 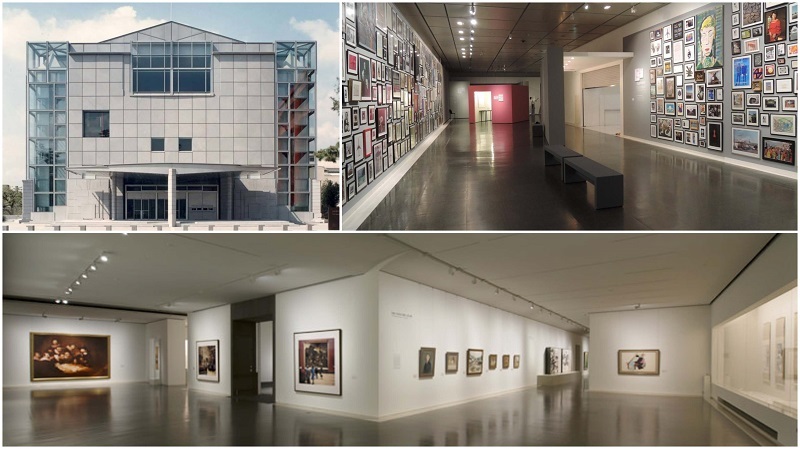 Visit the National Museum of Modern Art to see the riveting collection of modern Japanese art, Nihonga art, and a few contemporary Western-style exhibits. 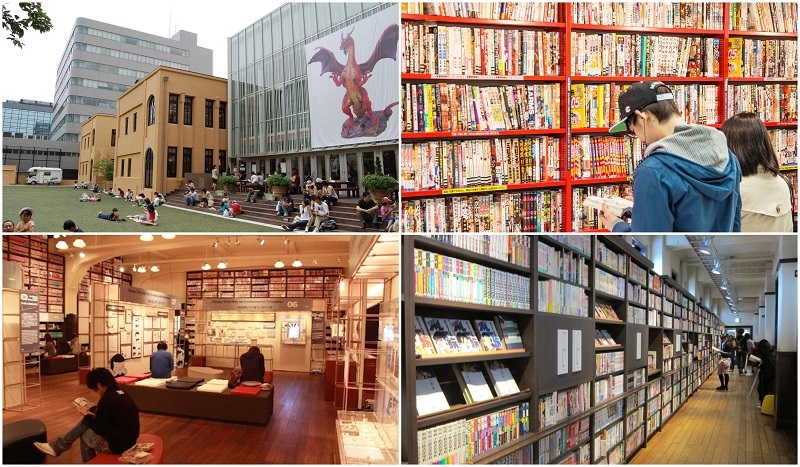 This museum was originally built as an elementary school and has since been turned into a shrine housing more than 300,000 items (manga-related and comic books). You can read any book you want, chosen from the numerous bookshelves that line most of the hallways and walls spread over three floors and the basement. Most of the collections are of Japanese manga, but there are some books that are of foreign origin and duly-translated. The museum also showcases manga-themed exhibits and events, with some of them featuring foreign artists. If you’ve seen an old Japanese samurai movie, there’s a good chance it was made by Toei Studios. This place is packed with old movie sets, ninja shows, haunted houses, and hundreds of people dressed as their favourite manga (Japanese cartoon) characters. Feel free to walk up to them and ask for a photo. Definitely a favourite for kids and their granddads. The area of Gion and Kawaramachi are the best areas to stay to get around Kyoto. They are incredibly convenient to go in and around due to its central location and they are well stocked with their own sights and entertainment options. If you are visiting Kyoto, be prepared to see A LOT of temples. While you may get “temple fatigue” towards the end, remember that all of these temples have their very own unique history and possess stark differences between each other. 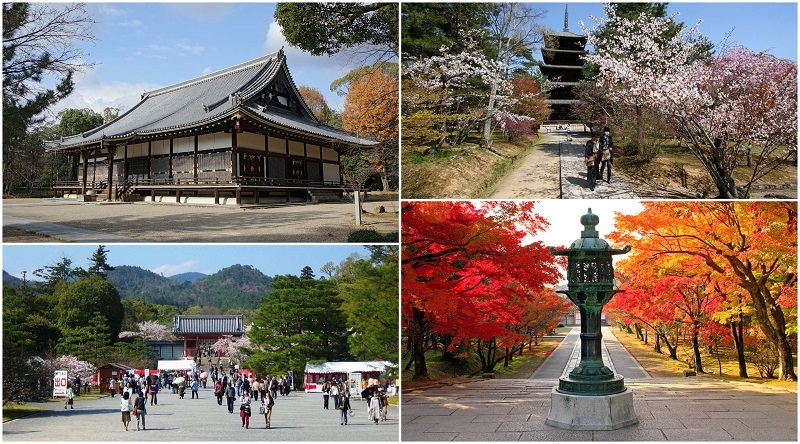 There are plenty of other things to do and see as well if you want to avoid temples in Kyoto. The itinerary is really helpful. But I would suggest staying at one of the Ryokan (traditional hotel Japan) as a couple. It just had a more romantic feeling to it. As for the length of the stay, I think 5 days in Kyoto is way too long, there is always a nearby city to visit like Nara or Osaka. I also recommend to rent a kimono for a day and strolled around Kyoto in kimono. It has a unique feeling to it. I think out of all the cities we’ve visited (Tokyo, Kyoto and Osaka), Kyoto is my favourite. There is something charming about this city that I did not feel in the other cities we went to. There were lots of nice temples and gardens albeit almost all of the attractions have an admission fee. Still, the beauty and splendor of Kyoto surpasses the many admission fees. If you will be going around Kyoto, I recommend getting a one day bus pass for 500 yen. Only get the bus pass if you will be using the bus more than twice since that’s when it will be worth it, otherwise single journey would cost around 210 yen.